For the last few months we’ve been searching for the next big thing on the UK’s food and drink scene – and what an amazing journey it’s been. With hundreds of entrants of incredibly high quality throwing their hats into the ring, it was difficult to pick out a shortlist, and harder yet to narrow this down to semi-finalists and finalists. From pitching to panels, to trading at intu stores across the country, it’s been an exciting time – but there could only be one winner. At an exclusive pitch event in London, the four finalists pitched to a team of all-star judges – Levi Roots, founder of Reggae Reggae Sauce, author and entrepreneur Alice Liveing, Paul Lindley of Ella’s Kitchen, and Jim Cregan, founder of Jimmy’s Iced Coffee. And the winner is… (drum roll please) – The Snaffling Pig Co.! Nick Coleman and Andrew Allen took home the prize of six weeks retail space in Intu Lakeside, the retail centre with the highest footfall in the UK. 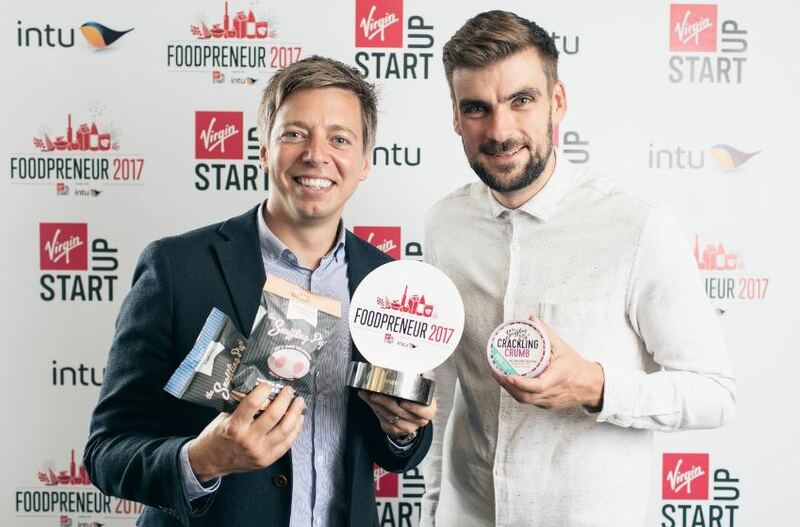 Their modern take on the stodgy old pork scratching, elevating it from pub snack to something a bit more gourmet, won over the judges, as did their inventive marketing, branding, achievements and – most importantly – passion. Huge congratulations to the Snaffling Pig team, and also a big round of applause to the other finalists – Rupesh and Alexandra Thomas of Tuk Tuk Chai, James Cadbury of Love Cocoa, and Jamie McCloskey of Love Corn. Thanks also to everyone who’s supported this third #VirginFoodpreneur competition. It’s been amazing to discover, once again, how the UK food and drink scene is just bursting with talent and innovation. Here’s to supporting many more future food and drink stars! Want to feel inspired? Click on the links below to watch the individual pitches.